Super Savings Item! Free Shipping Included! 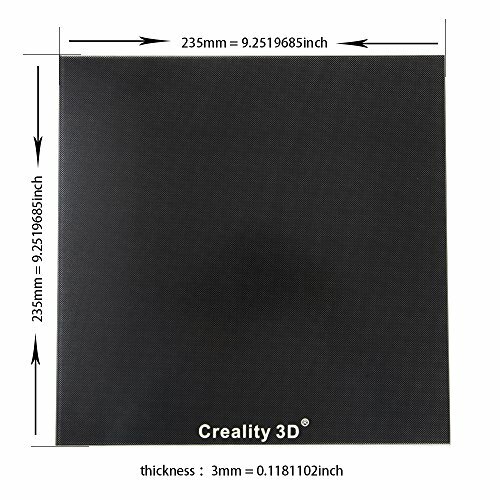 Save 31% on the Creality Upgraded 3D Printer Platform Heated Bed Build Surface Glass Plate 235x235x3mm for Ender 3 Hot Bed by Creality 3D at 3D Printing Supplies Outlet. MPN: BL2452018616. Hurry! Limited time offer. Offer valid only while supplies last. The same installation holes as the standard MK2 and MK3 hot bed, and it's compatible with almost all 3D printers with MK2 and MK3 hot bed. The same installation holes as the standard MK2 and MK3 hot bed, and it's compatible with almost all 3D printers with MK2 and MK3 hot bed. 1.Excellent adhesion: Ultrabase covered by microporous coating, shows strong adhesion in printing. Easy to take off models by hand or with a little help from the scrapper for very large models. 3.Durable: The special coating is inorganic and has a hardness of 8 Mohs, and it is capable to work at 400ºC. 4.Easy to clean:easy to clean by alcohol/water. 5.Compatibility: compatible with all the Cartesian style 3D printer with a MK3 heated bed. Very easy to take off the models; No tools needed when removing models. Use clips to fix the glass plate on the hot bed. Higher temperature higher sticky. The models will stick on bed firmly when temperature is high. Fit for Ender 3 and Ender 3X 3D printer.